Rainald Grebe (artist/performer/comedian) slowly walks out on-stage in a slow, manner as if lacking intellect, while dressed in a pathetic mish-mash of Indianer (the German word for Native Americans of North America), and the audience immediately begins to laugh. That’s the intro for one of Rainald Grebe’s stage shows. It is not funny. 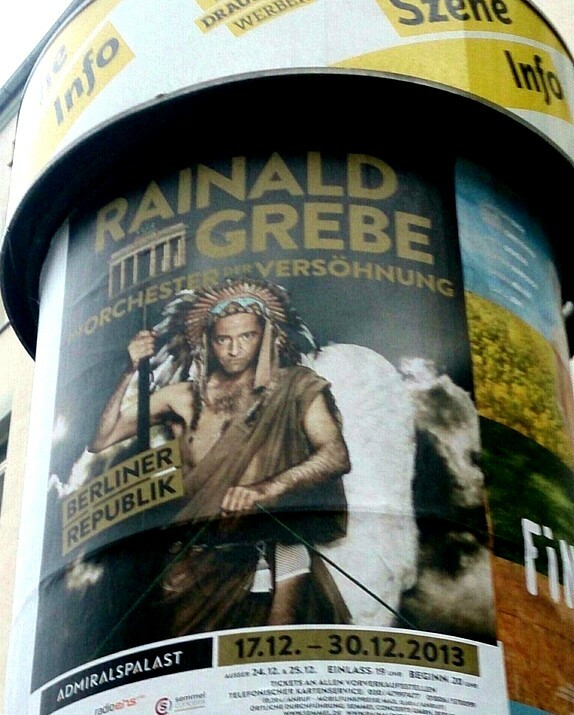 Upcoming December, beyond just appearing a comical figure, Herr Grebe has decided to go all-out in his Indian “costume” this time, and thousands of posters can be seen across Berlin showing this kind of cultural abuse long substantiated as harmful to both Natives and non-Natives by social scientists (American Psychological Association, 2005). For whatever reason he does so, thinks its acceptable, funny or cutting edge, in reality it is culturally ignorant, offensive and without any redeeming merit, and at this time of the year, unfortunately he is not alone. You’ll always have those, by majority Anglos but even some natives as well, that are dismissive of the topic of Indian costume wearing, and little kids doing so to the approving smiles of their parents which just makes me shake my head and look away as its a non-topic, but people like Grebe take this to a whole different level. Watch his videos, the mockery he makes of Indians even if he doesn’t think/mean to, and he’s doing it for profit. The campaign “We’re a Culture, Not a Costume” was started by students teaching about racism in society, and Rainald Grebe is an example of not just the activity, but the promotion of copying other cultures for one’s own benefit. These are just a few, but they are all phrases these ones use to try to excuse the fact they are disrespecting someone else’s culture JUST BECAUSE THEY WANT TO. This is continuing colonialism and a more subtle form of racism, attributing and reinforcing white privilege and supremacy. These days, ignorance is a part of the problem, too: people in Germany aren’t taught colonial history, the brutality and genocide committed to give them the privilege to find entertainment and humor in stereotyping of peoples they helped oppress and marginalize. Update: our documentary Forget Winnetou! Loving in the Wrong Way, will be addressing this attitude and behaviors, and much, much more. Posted in Activism, Announcements, Berlin, Current Events, Germany, Native American. Tagged cultural appropriation, fake Indians, idle no more, indian costumes, indian fakers, native american, rainald grebe, we are not costumes we are a culture. Thank you for speaking out on this. We need to be vocal and gently educate these Europeans how offensive it is to “play” Indian. I realize it may not educate this performer, but I do hope it does help some Europeans, I completely agree with you.